Are you ready to be mesmerized by a new & fresh Hip-Hop trio with a bring it back 80’s groove? HYPER CRUSH is a “back to the future” group that brings their own flair to old school 80’s rap music. Coming hard and in your face meet the rapper, DJ and vocalist who are not afraid to take it to the next level. SayWhatNews: HYPER CRUSH is in the house. Good morning, sorry to have gotten you guys out of bed so early. Tell us who is HYPER CRUSH? HYPER CRUSH: Preston, Donny, and Holly. SayWhatNews: How did Donny Fontaine, Preston Moronie and Holly Valentine come to be HYPER CRUSH? HYPER CRUSH: We’ve all been friends for a long time. We were all in different groups at one point. Then we decided to all get together and form the sickest group known the mankind, Hyper Crush. 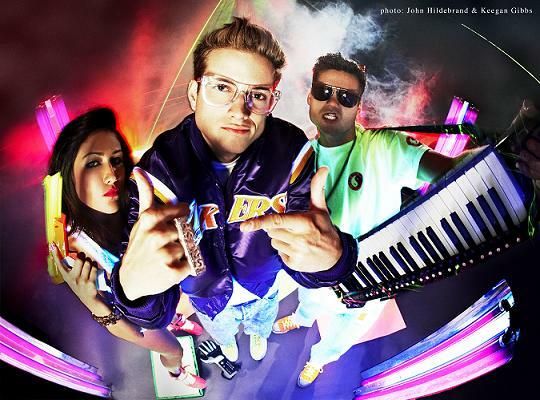 SayWhatNews: Who came up with the idea to create a 80’s inspired Electro-Hip-Hop Rap Group? HYPER CRUSH: It was a natural process. We started out as a 50’s/doowop group. We sampled a lot of older songs from the 40s/50s and talked about greasers and poodle dresses. From there we progressed into the 80s and got more into electronic and synth sounds. The Arcade was 13 tracks of electro goodness and our new album is going to take it to another level. SayWhatNews: So Donny, when did you start rapping? SayWhatNews: Preston is the Producer/DJ. Your mixing skills are hot. Are you self taught or did you take some-type of professional training? Preston: It’s all self taught. I would just spend hours playing with new programs, different sounds, and coming up with beats. SayWhatNews: Holly, at what age did you realize you had the gift of song, your voice is amazing? Holly: Aww thank you. I’ve always loved singing. It’s just been something that I enjoyed and started taking it more seriously when we started the group. SayWhatNews: You guys are a no holds barred group, you have no problem telling like it is and just being free and wild. Where you afraid that your image would be too much for today’s music industry? HYPER CRUSH: Nah, we just do what we do. Our style, both musically and personally, is something that is going to be the new mainstream. We’re new and fresh, but at the same time we’re bring it back. Back to the future. So there’s something for everyone. SayWhatNews: Who were your musical influences growing up? HYPER CRUSH: It was totally mixed. Price to Danzig. And Eddy Grant to NOFX. We pull from al different influences. SayWhatNews: I am totally feeling your 80’s themed clothes. Where do you get your clothes from and do you have a stylist? HYPER CRUSH: We style ourselves. Holly is really into fashion. We get a lot of our stuff from ebay and thrift stores. SayWhatNews: There has been several groups are bands who tried to go back and re-invent or re-create 1980’s music with their own twist. What sets HYPER CRUSH apart from the rest? HYPER CRUSH: We do our own thing. There is no other Hyper Crush so nobody does it like we does. SayWhatNews: My favorite song is “Robo Tech”. What inspired this song and why do you think so many people are feeling your sound? SayWhatNews: What artist if any would you love to collaborate with on an project? SayWhatNews: HYPER CRUSH music has been featured on some of MTV’s hit shows like The Hills, Real World: Brooklyn, Bromance, and The City. How surreal was that when you learned the news. HYPER CRUSH: It was cool. SayWhatNews: Your music has more than 1 million plays on Myspace alone. When can we expect an album? HYPER CRUSH: The new album will be out some time this summer on Universal Motown. It’s going to be epic. SayWhatNews: So, how did HYPER CRUSH get signed with Universal Motown? HYPER CRUSH: We had been in touch with them for awhile. We were doing our own thing touring, putting out music, and promoting ourselves. The timing was right and we made the move to the majors. SayWhatNews: You guys are so busy with promoting your music and touring. What do you do in your spare time to have fun? HYPER CRUSH: Watch movies, go to the beach, hang out with the family. SayWhatNews: If you had front row seats to a concert who would be playing and why? SayWhatNews: What’s next for HYPER CRUSH?